The historic Stonyhurst College, set in a beautiful rural estate, is a glorious venue for a summer’s evening concert. Probably the best known former student of this renowned Jesuit College is Sir Arthur Conan Doyle creator of the fictional detective Sherlock Holmes. Evidently too, J. R. R. Tolkien wrote some of his epic fantasy novel The Lord of the Rings at the college. The Stonyhurst College Centenaries Theatre is the venue for the annual ‘Ribble Valley International Piano Week’ and it was there that I interviewed popular London born violinist Tasmin Little who was giving the Gala recital on one of the evenings. While I cannot report seeing the Bilbo Baggins the Hobbit inheriting a magic ring in Middle-earth or hearing Sherlock Holmes sawing away at his fiddle to help him solving a case of national importance, I met Tasmin prior to her afternoon rehearsal with her accompanist, the Festival’s Artistic Director Martin Roscoe. I was struck by her undoubted enthusiasm and willingness to talk frankly and freely about her playing career and varied aspects of the classical music. Michael Cookson: Concert promoters generally want you to play the standard repertoire. I was wondering how you can keep your performances fresh when you are playing the same works so often? Tasmin Little: Yes, it’s a very important question. I think it’s a question that every musician must ask themselves on a regular basis. In other words, why am I still doing this? Am I still doing this because it excites me and because I love it? Or am I stuck? Am I in rut? I have two ways that I use to keep myself fresh. Not only do I have a great interest in a wide repertoire and promoting contemporary works. Digging out works that have been unjustifiably neglected. Not only is that interesting to me but it’s a very major way of keeping me fresh about playing more standard areas of the repertoire. If for instance I am playing a well known concerto such as the Mendelssohn…. [MC: Not forgetting the Bruch.].. Certainly, they are the two works that get asked for probably more than any others. Understandably so. One has to remember that these works are popular and have stood the test of time because they are great pieces of music. Now, how do you remember after you have played the Bruch and the Mendelssohn as many as ninety times what is it that makes me think that this is still a great piece of music? There are a couple of things. The first thing is have I been doing many things in between my performances of say the Mendelssohn? For example I recently gave the world première of Willem Jeths’s Concerto in the Concertgebouw. Or maybe I have been playing a recital full of all sorts of new and wonderful pieces. I then find myself standing up on stage to play the Mendelssohn and I’m greeting this piece as a well loved and old friend. I’m remembering that I love this piece and that I feel secure that I know it. But not so jaded that I’m unable to give my best. MC: Is there anything else you can do? TL: There is one other thing that I frequently remind myself. That can come from direct personal contact with someone or simply from me remembering that there will be at least one person and possibly many more who will be hearing that piece of music for the first time. I’m sure that at every concert there will be at least one person who has never heard the piece you’re playing before. It’s a wonderful thing remembering that you’re on that journey - that you’re remembering how it can feel to be listening to a great piece for the first time. I love that idea. That’s an idea that makes me remember that I must be as new in a way, as new to this piece as the person who is hearing it for the very first time. Whilst I have to also incorporate the experience I have had from playing that piece many, many times. There is no doubt that the more you play a piece, the better you can understand it, the better you can communicate it. Although it’s very exciting to play a piece for the very first time, actually, once you have had the experience of playing it a few times, or perhaps many times, the benefit of that knowledge aids the performance. MC: You are playing César Franck’s A major Sonata this evening. That’s a work that’s played over and over again in recital. TL: Yes, it is extremely popular. Although, in fact I haven’t played it for about two years. But you see I have a massive repertoire. I play nearly sixty violin concertos and I probably play two hundred works for violin and piano. I rotate things so that I’m not playing the same pieces over and over again. For example I haven’t played the Brahms D minor Sonata for violin and piano for what seems an age. [MC: A truly wonderful work.] Or any of the Bach Sonatas. I’ve not played a Bach Sonata in the concert hall now for at least a year. So I’ll come back to one of them, whichever one it is, and again there’ll be that renewed sense of excitement in hearing that piece with the benefit of everything that I’ve just been doing as well. That’s with the benefit of my playing, say, the first Prokofiev Sonata or whatever. At the moment I’m preparing another Dutch Concerto by Theo Loevendie that I’ll be playing in the Concertgebouw in September. I’ve got that concerto going through my mind now. In addition I’ll be playing the Brahms Concerto in September. [Note: at Ljubliana, Slovenia]. I haven’t done the Brahms for about three years. MC: So by playing a wide range of repertoire you are in effect avoiding the ‘same old, same old’. TL: That’s the answer to your question. How I keep the works sounding fresh is by ensuring that the volume of the repertoire that I am playing is first of all continually developed and secondly the amount of repertoire that I am doing at any one time is not so narrow that I am perpetually walking on stage playing the same thing. There is a final answer as well to your question which is that I am a great believer in taking time away from the instrument. I like to have a really good break. Sometimes I will have a break of as much as a month but in truth I don’t often get the opportunity. MC: I know performers can take some time to get back to their usual standard of playing. Can you pick the violin back up easily? TL: Yes, I can pick it up quite quickly. Everybody’s different of course. I’m quite lucky I can have my fingers back in two or three days. That’s fine and that encourages me to continue to take the time off. Sometimes I will take just twoweeks off which is a wonderfully long time to not be playing…. Yes, I really notice the difference. That brings me back to what you asked me earlier. As musicians we must continually ask ourselves regularly why are we standing up on stage? Is it a habit or because we want to be here? The one thing about taking time off is that it makes me genuinely remember that I love playing the violin. I actually physically want to pick up the instrument again. I want to feel the violin in my fingers. MC: Not forgetting that your playing gives pleasure to the audience too? TL: That aside. Playing actually gives me pleasure. I want to play because I love playing. I certainly love communicating but that’s a separate thing. You have to love playing as much as communicating. I communicate with an audience in many ways; I can open my mouth and speak. MC: About neglected masterworks of the repertoire. A personal favourite of mine is the Britten Violin Concerto…..
[TL: Yes, it’s an amazing work.].. It’s not played anything like as much as I had imagined. I discovered only the other day that up to last year an orchestra as esteemed as the Berlin Philharmonic hadn’t played it for fifty years. Another favourite of mine, the Walton Violin Concerto, is another case in point. TL: Well most of my life I’ve been championing neglected works. The Delius Concerto, the Moeran Concerto and the Finzi Concerto are obvious examples. [MC: I have a treasured copy of you playing the Rubbra Concerto.] Yes, that’s right… You see I was playing the Britten Concerto when no-one else in this country was playing it. I’ve been playing the Britten from 1990 but it’s only recently become more widely played. Then Maxim Vengerov took it up and recorded it. Another example is the Elgar Violin Concerto which is actually only rarely performed in this country. I know it’s hard to believe nowadays because it’s considered a staple of the repertoire. Twenty years ago when I was performing it no one else except Nigel Kennedy was playing it. Now it’s so often recorded. In fact, I’ve just made my first recording of it..
Everyone was surprised that I’d not done it before. I’ve recorded it for Chandos and It’ll be released in autumn this year to coincide with the centenary of the first performance of the work. But it’s not fair to say anymore that the Elgar Concerto is the most neglected. For me it must be the Walton Concerto. [MC: It’s a glorious work so infused with that sunny Mediterranean feel.] For me the Walton is a neglected masterpiece. I recorded it with Andrew Litton and the Bournemouth Symphony Orchestra back in around 1995. It’s a fabulous, fabulous work. There are some amazing recordings of it. [MC: My first was the account played by Menuhin conducted by the composer.] And there is the excellent version from Kyung Wha Chung too with André Previn from the early 1970s. The Walton hasn’t had its renaissance yet like the Britten or the Elgar Concerto and it is the one that I would like to see more on concert programmes. MC: Tasmin, of all the conductors that you’ve worked with [TL: Oh, Simon Rattle.] who is the greatest and in what way? TL: It’s got to be Simon Rattle…. Yes, Simon takes the top position in every way without a doubt. I think any good performer has to have charisma, a presence, or otherwise they walk out on stage and nothing happens to the audience. There has to be that moment when an artist walks out on stage and the audience sits up, they want to listen and want to watch. MC: Some months ago I saw Simon Rattle conducting a performance of Haydn’s The Seasons with the Berlin Philharmonic at the Philharmonie and the standard of performance was incredible. TL: Yes, performances that make you want to sit up and want to listen to every note that’s being played. I think Simon is an immensely talented conductor, an absolute genius and I love working with him. MC: The Berlin Philharmonic clearly agrees as they’ve extended his contract to 2018. TL: I remember going to do a tour with Simon soon after he had taken over in Berlin. He took me on tour with them in 2003. We went to Salzburg, did the Proms, the Philharmonie, Berlin and we went to America also. The piece he did in the second half of the programme was Beethoven’s Pastoral Symphony. Then it would be about two years ago I was back in Berlin and the night before I was playing I went to a Berlin Philharmonic concert. I was in the audience and Simon was conducting the Pastoral Symphony again. Well the difference in five years or so was incredible. He and the orchestra had grown together and it was like the most wonderful kind of marriage, or relationship, or partnership. He barely had to move, he hardly gestured, because he and the orchestra knew each other so well. It was a truly beautiful thing to watch. MC: I’d like to bring up the topic of period instruments. I’m wondering if the authentic instrument movement has ever interested you? I see the violinist Viktoria Mullova has embraced it wholeheartedly. TL: I think it’s impossible not to be affected by the interesting variety of sounds that people create when they play authentically, as it is called; with special reference to how things may well have been done. But I choose my words with care because we have a great tendency to generalise. I’m sure that there would have been as much variety in baroque performances back in Bach’s time as there will be in performances today. So I think from that point of view it’s a wonderful thing to be aware of the fact that there would have been gut strings, very little vibrato and that ornamentation would have been done in a certain way. All of that must have a bearing on how modern violinists, if I may call myself that, interpret a piece of music. MC: I see that you play early instruments fitted with a modern set-up. TL: Exactly, a modern set-up. I don’t play on gut strings and I do use vibrato. But when I’m playing Bach I wouldn’t dream of applying the same ideas, either technically or from the point of view of vibrato, as I would if I was playing Brahms. MC: So yours is a period informed approach. TL: Yes it is. I definitely adjust the kind of sound that I am creating to bow in homage to that style of playing. MC: Have you ever used gut strings or a period bow? TL: No, it’s not for me. There are other people who are doing it; specialists in that field. That’s what they do so very well. I play repertoire ranging from Bach to works that were written last week. Well I’m a performer who really loves the whole range of repertoire. I’ve never really wanted to specialise in anything. I love the fact that I have at my fingertips literally three hundred years worth of music and I love being able to play the full range. TL: When I brought out my recording The Naked Violin I did record the third Partita in E Major; which is the final of the six works. 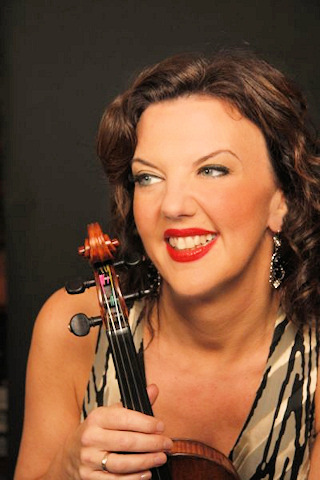 That is still available on my website http://www.tasminlittle.org.uk / as part of The Naked Violin project and free for download. No, I’ve not recorded all six works. [MC: Do you intend to?] I don’t know whether I would record the complete set. They’re not on my list of priorities at the movement…. [MC: So many violinists consider them as an Everest of the repertoire and they are a rite of passage for some performers.]…. They are absolutely wonderful. I’ve had plenty of my own rites of passage such as when I played the Ligeti Violin Concerto that provided me with a considerable challenge. MC: How do you programme a work such as the Ligeti Concerto? TL: Well the programme should have a variety. I love to create a recital programme and I consider the repertoire very carefully. I take into account how pieces will follow on from each other and really get a shape to the programme. If I include a more challenging work I would definitely offset it with works that people will not find difficult. I often find that when I have put in a more challenging work, that may require more concentration from the audience or one that is simply unknown, that is the work that people speak about the most. I believe that people love to hear something new. MC: Let me mention Menuhin; Oistrakh; Mullova; Vengerov; Znaider and Tasmin Little all talented world famous violinists and all of them conducting. Oh, it will be a while before I get to Bruckner. Conducting is not something that I’m pushing for. I do enjoy it. I want to do it in a way that feels completely natural. So it’s not something that I’m pushing for in any shape or form. People are gradually coming to me and saying will you conduct for us? I was working with the Seattle Symphony Orchestra and I played and directed the Vivaldi Four Seasons and the Piazzolla Seasons. [Note: Ástor Piazzolla: Las Cuatro Estaciones Porteñas: The Four Seasons of Buenos Aires] So it has become quite natural for me to turn around, address the orchestra, conduct the orchestra and then join in. MC: Which of your instruments have you chosen to play tonight? TL: Tonight I’m playing the Guadagnini. [Note: Violin by Giovanni Battista Guadagnini from 1757] I also have a 1708 Stradivarius on loan from the Royal Academy of Music known as the ‘Regent’; a rather posh title. Yes, I have. The Guadagnini is fantastically suited playing to chamber music as it has an amazing variety of colours. That’s not to say that the Stradivarius doesn’t. But the Stradivarius really comes into its own when I’m playing with a full symphony orchestra in a very, very large concert hall. You see the Stradivarius has an amazing capability of cutting through the orchestral sound and projecting a very large sound. If I’m in a really reverberant acoustic then I need to play and articulate in quite a different way to playing in a small hall that doesn’t have much echo. Then you can afford to play in a more natural style, in a way, because you don’t have to artificially cut a note slightly short in order for the next note to be heard and projected. So sometimes playing in a dryer hall can be easier. Although it can be harder work from the point of view of what you hear under the ear doesn’t necessarily sound quite as good because you are getting it very raw if you like and without the benefit of any sonority and added reverberation. MC: Would you say you were an intuitive player or a more analytical player? TL: I would like to say that I bring both those qualities to my performance. Because I think that its no good being a performer and not having an intuition about music. On the other hand if you only have intuition and you’re playing a very complicated piece of music and you want to bring out certain ideas or certain facets of that music you need to bring your intellect to bear as well. So I think that music without intuition is too dry but intuition without intellect can be a little over indulgent. Yes, it’s all about balance. It’s about bringing both of those sides into the performance. To be able to sense how a performance should go then also to know in your head where you want it to go as well. MC: When I look at the age profile of classical music audiences I have concerns that young people are not being attracted in sufficient numbers to classical music. Where is our audience of the future? To just own a type of music. Whether it be rap, techno; rock or whatever its part of the identity of young people that they should have something that they can call their own. Something that distances and separates them from other generations. I think it’s a natural thing. You won’t get rid of it and neither should you. It’s part of a young person’s development; part of knowing who you are. This gives the possibility when you are older to look back, rather nostalgically, on it as there will be the new generations of young people who have found something completely different. That is the nature of it. There would have been parents of young people who thought that Elvis was shocking and why couldn’t their nice young children listen to classical music. Now in retrospect he doesn’t seem that shocking at all. The reason why I don’t fear for classical music is because it’s something that many people come to in later years. They realise that there’s a whole world out there that they didn’t want to know about when they were young. But I actually think that the older audience will in time be replaced by the younger people when they grow older and discover classical music for themselves…. The other thing we can do in order to perhaps try to bridge the gap is to go and play classical music to school children of all age’s right up to eighteen years old. I do this all the time. That will introduce them to some classical music and you will be amazed at the response. Yes, I do think there is more that we can do but I’m also not sitting here holding my head in my hands fearing for the future. Classical music has been around for some a long time and is going to be around a lot longer. MC: Recently I was having a similar conversation with Andrew Manze who felt that classical music might appear too restrictive to young people. That the setting of it in a concert hall where the players wear evening dress, having to sit still with no talking and having to clap in the right places, may be off putting. TL: Quite a lot has been done recently to encourage young people to develop an interest in classical music and to make it as friendly as possible and more informal. I think the Proms is a perfect example. The tickets are very cheap if you want to promenade; there’s nothing stuffy about that at all. So I think there’s plenty to be optimistic about for the future. MC: That’s a most encouraging answer and you seem quite upbeat about it. Thank you Tasmin for taking the time to speak with me today. TL: It’s been a pleasure. Thank you.